With a view to further improving the availability of potable drinking water for rail passengers, the Ministry of Railways has formulated a comprehensive uniform policy for installation of water vending machines (WVMs) at railway stations across the country. Under this project, water vending machines are being installed at the Bathinda railway station, to provide passengers safe and chilled drinking water at nominal price at the city railway station. The Ambala Division of the Railways have decided to install five water vending machines at the railway station here. These water vending machines are being installed by the Indian Railway Catering and Tourism Corporation , which will dispense drinking water that will be purified by Reverse Osmosis, UV Sterilised and a seven-stage filtration process. LED display screens on the machine will show the cost and quality of the water to customers. Passengers will get 300ml of water by spending Rs 1, provided they have an empty bottle. If the passenger does not have a bottle then he/she has to pay Rs 1 for the bottle to get 300ml of water. Likewise, passengers can avail purified water through the process of reverse osmosis at Rs 3 for 500 ml (Rs 5 with bottle), Rs 5 for one litre (Rs 8 with bottle) and Rs 8 for two litre (Rs 12 with bottle) and Rs 20 for five litres (Rs 25 with bottle). This facility would benefit the passengers as they have to spend less on buying water under the project. 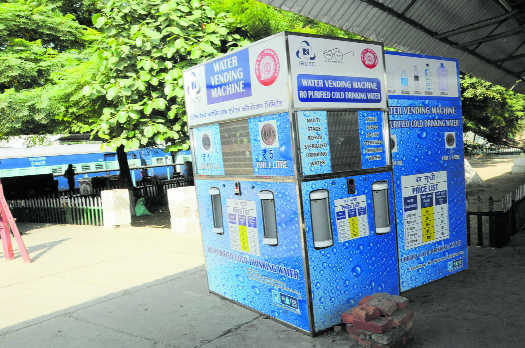 Bathinda Railway Station Superintendent Ramswaroop Meena said five of these water vending machines have come up at the city railway station and would become operational soon. He said the plan was to install water vending machines at the station, which would facilitate passengers to get purified chilled drinking water at nominal rate. Though passengers have welcomed the initiative, shopkeepers selling packaged drinking water on platforms fear slump in their business.